Everyone is calling Amazon’s Cloud Reader primarily a play to get in-app purchases on the iPad, but it’s much more than that. It means ubiquity of the Kindle platform across any new device that comes along, without requiring any additional app development. Amazon’s going to win the battle for the ebook space by being everywhere. After I tweeted the previous paragraph yesterday, in a couple parts, Erica Naone asked me to share a few more thoughts on the subject for her article on Amazon’s Cloud Reader, I thought the rest of my comments, phrased as responses to her questions, were worth posting in full. Amazon has worked hard to create apps specific to pretty much every platform available, which is one of the biggest reasons I read Kindle books almost exclusively. But it becomes a huge burden, and a losing game, to put this much development effort into every new operating system, especially ones whose user base and outlook is questionable. 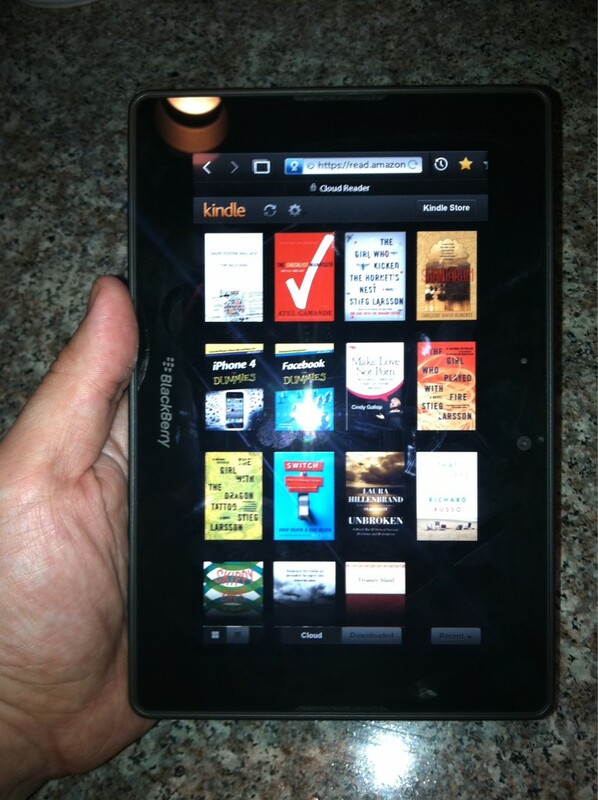 I bought a BlackBerry PlayBook the week it came out, largely on Amazon’s promise of a Kindle app on the way. Now, months later, it’s still not here. I have a feeling Amazon put their resources behind the HTML5 solution, which would keep them from having to develop for webOS, the PlayBook, and any other new OS that comes along in the future. Interestingly, though Amazon’s Cloud Reader doesn’t officially support the PlayBook browser, it does work for me, which makes the tablet so much more useful to me now. Rather than look at Cloud Reader as a direct response to Apple’s enforcement of its ban on in-app purchases, I’m actually surprised it took Amazon this long to release the browser version of their Kindle reading experience (which probably has more to do with HTML5 than anything else). When I worked so hard to hack my PlayBook into a way that would let me read Kindle titles, I actually wondered why the browser solution wasn’t available yet. I’d already hacked my Nook to run Android 3.0 (Honeycomb), primarily so that I could read my Kindle books on it, but it shouldn’t be that hard, and the average consumer won’t be able to do it. Now, they don’t have to. Amazon’s done the work for them and made their entire Kindle library available, on any device (soon, once they work out the kinks, I imagine), and everywhere. In the near term, this move does appear, on the surface, to be an end run around the in-app purchase exclusion in the iBookstore, but that’s a red herring that seems appropriate only because, at the moment, the only supported browsers are iPad’s Safari and browsers for the desktop (Chrome and Safari). I don’t think people want to read in the browser from a desktop, but that’s hardly the point, because there already are desktop apps for that. I do think that having a browser-based solution will allow most users to read “in a browser” without even thinking about it. When you put a shortcut to the Cloud Reader on your PlayBook desktop, it just behaves and feels very much like an app. This move puts Apple and other formats far behind them. The first ebooks I bought were on my iPad from the iBookstore, but I had an Android phone at the time, so I couldn’t sync. Since then, I’ve been sold on the Kindle platform, because I can read it on any device, anywhere, and sync automatically. I read on my iPad before bed, on my PlayBook or Nook when I’m traveling, and on my iPhone when I’m standing in line at the grocery store, and I’m always on the page where I last put the book down. Amazon’s Kindle platform is indeed becoming the de facto standard for consumer books. I do wish they would support EPUB, as it’s a much more open and flexible format (and that’s what I read my own company’s books on, because we can update them much easier and always be current with the technology, which we can’t do through Amazon), but for the general consumer, I think Amazon has won the war, while Apple has focused on battles that weren’t really worth fighting in the big picture.